The NOYES FLX380 FlexTester is the world’s smallest, lightest, most complete single-mode fiber optic test set. It combines high-performance, PON-optimized, multi-wavelength OTDR/PON OTDR, OLS, OPM, VFL and PON Power Meter in a rugged, hand-held package. • Fast, error-free loss-testing using Wave ID synchronization. • Integrated 50 m launch fiber. 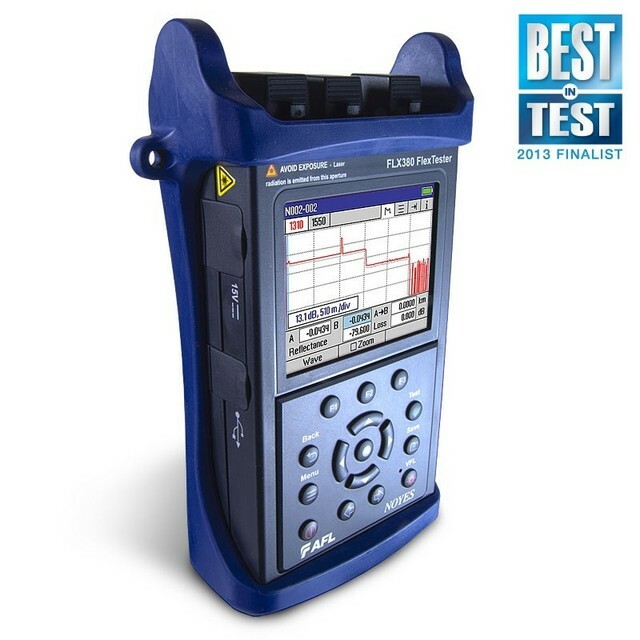 • FLX380-103: Most complete high-performance test set for verifying both in-service (live) and out-of-service FTTx PONs. Includes ServiceSafe™ live PON detection, integrated PON power meter and 1625 nm filtered live PON OTDR, all from a single port. • FLX380-102: 1310/1490/1550 nm OTDR, OLS, OPM and VFL for complete out-of-service testing at all FTTx PON wavelengths. • FLX380-100: Lowest cost, high-performance, all-in-one 1310/1550 nm OTDR, OLS, OPM and VFL for out-of-service installation testing or troubleshooting both FTTx PON and point-to-point fiber optic networks. 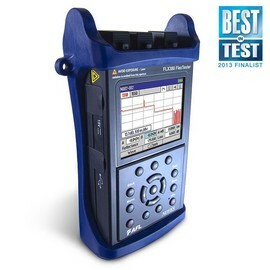 • FlexTester PRO Test & Inspection Kit – Combines user-specified FLX380 FlexTester with standard accessories plus FOCIS Fiber Optic Connector Inspection System and optical connector cleaning supplies into a rugged, waterproof hard-shell carry case. • FlexTester with Soft Carry Case – Combines user-specified FLX380 FlexTester with standard accessories and One-Click Cleaner into a convenient, lightweight soft carry case. • Standard OTDR, live PON OTDR, PON power meter – from one port!